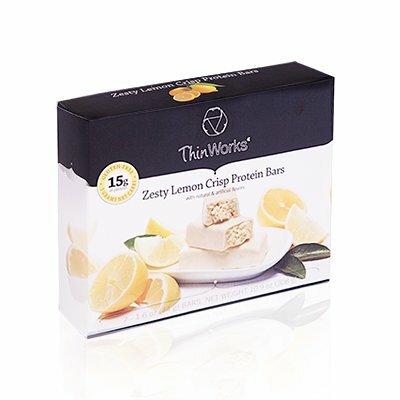 ThinWorks Zesty Lemon Crisp Low Carb Protein Bars - Be Happy Dieting! Enjoy the zesty lemon taste and the sweet yogurt coating of these crispy low carb protein bars! ThinWorks’ low carb protein bars are an excellent choice on any weight loss diet as a snack or substitute for a small meal when you’re on the run. There is no reason to suffer through bland and tasteless diet bars when you can truly enjoy your snack while keeping your calories and carbs down! Supplement your weight loss with 15 grams of protein and only 5 grams of net carbs per bar. Each box contains 7 individually wrapped bars. Great for weight loss, post workout recovery, healthy snack, traveling, or meal replacement!